What are the Best Anvil Pruners of 2019? The Gardenite Power Drive Anvil Pruner are the best anvil pruners based on the value they provide. There’s always been this question when it comes to anvil pruners. Sure you need a good pair of bypass pruners as part of your gardening tools. But what about anvil pruners? Bypass pruners are the best for pruning green wood. That’s because they make clean, precise cuts on branches, stems, and shrubs that allow them to heal fast and prevent the risk of disease. Anvil pruners, on the other hand, are not good for cutting green wood. They crush the wood instead of providing clean cuts. So the reason to use anvil pruners is to either cut dead wood or to make some initial cuts on branches before using bypass pruners to prune them. So take my advice and invest in a good pair of anvil pruners. We’ll show you exactly how you can choose the best anvil pruners for your gardening needs. What is an anvil pruner? Do you need an anvil pruner? A pruner is a gardening tool that helps you cut live or dead wood like plants, branches, and shrubs that are up to 1 inches thick. A pruner can be either a bypass pruner or an anvil pruner. A bypass pruner has two blades that bypass each other similar to the blades of a scissor. This makes it possible to get clean, precise cuts when you prune branches. Such cuts are good for the plants because they heal faster and help prevent disease while allowing the plant to grow. An anvil pruner has one sharp blade and an anvil as the other blade. You can think of the sharp blade as a knife that falls on to the anvil that acts like a cutting board. This makes it possible to cut hard wood without applying a lot of force. However, the cuts are not as clean as a bypass pruner. This makes anvil pruners more suited to prune dead branches and shrubs. If you have a garden then it’s very much a possibility that you’ll end up cutting dead branches and shrubs. You don’t want to use your bypass pruner for such wood because you’ll end up damaging them. Instead, get yourself a good pair of anvil pruners that will help you cut dead wood fast and easy. You’ll find a range of anvil pruners available but there are certain key factors you should be aware of that will help you make your buying decision. Pruners can be used to cut branches that are up to 1 inches thick. But when you buy an anvil pruner you will find the cutting capacity varies from ½ inch to 1½ inches. So make sure to choose one that best fits your needs based on the wood that you’re going to be cutting. Blade quality plays a very important part in your selection of the anvil pruner. A high-quality blade will stay sharp for a long time. And you’ll be able to re-sharpen them when the need arises without losing out the quality. Usually, the blades of pruners are made of hardened or high-carbon steel. They may have a non-stick or low-friction coating on them to improve the cutting and prevent sap from sticking the blades together. They may even have an anti-rust coating to protect the blades from rust due to the moisture. The blades of an anvil pruner can be quite sharp and if you’re not careful you can end up injuring yourself. That is why it is important that the anvil pruner has a good locking mechanism that keeps the blades in the closed position when not in use. One of the other important factors when choosing a good quality anvil pruner are the handles. Since you’ll be using the anvil pruner for a lot of cutting you want to make sure that the handles are comfortable, lightweight, and durable. Many anvil pruners will come with a cushioning on the handles so you can cut with ease without feeling discomfort on your hand. The size of the handles also differs based on the hand size. So pick the one that matches your hand size whether it is small, medium, or large. You may find some anvil pruners come with rotating handles. This makes them very comfortable to cut hard wood but does take a little bit of getting used to. You may get anvil pruners that are simple in function and just cut the branches between the blade and the anvil. But you may also find some that come with a ratchet mechanism. The mechanism makes use of a ratcheting system where the pruners will latch into the wood as you squeeze. Then you can release the pressure and continue to squeeze again. Such a system helps you cut branches up to 5 times faster than a regular anvil pruner. Most anvil pruners are small in size and have a weight that you should be able to handle while cutting for a long period of time. One of the reasons to use a pruner instead of a lopper for small branches is because they are small and lightweight so you don’t end up getting fatigued. But the anvil pruners will vary a bit in their weight based on their length as well as the material they are made of. So choose an anvil pruner that you feel comfortable holding for some time in your hand. Anvil pruners are tools and like most tools, they will break down in a few years time. And it might be cheaper to just get replacement parts instead of getting a new one. So if you’re buying an expensive anvil pruner it would be good to check if they have replacement parts available in case you need them. The price of an anvil pruner can vary depending on the quality and brand. So choose one that suits your needs with the budget that you have. Having said that, our suggestion is to go for the best quality anvil pruner even if you do some occasional pruning because it will give you excellent cutting performance and last you for many years to come. So it’s worth spending a few more bucks for the value that you will end up getting. It’s always good to get as much warranty on your anvil pruner as possible because you never know what can go wrong while using them. Some anvil pruners come with a lifetime warranty which is a good thing to have. The anvil pruner is a very simple cutting tool that you should not have problems learning to use. But there are a few tips that you may find useful to keep in mind before cutting. It’s important to keep the blades of the anvil pruner sharp so they cut well as well as avoid damage to them. So before you start cutting make sure the blades are sharp. Before using the anvil pruner, clean the blades of any rust, sap, or dust using orange oil or vinegar. Always use anvil pruners for cutting wood they are meant to cut. Don’t try to use them to cut wood that is thicker than prescribed as you will end up damaging the blades. If the wood is more than an inch thick, you’re better off using a lopper. It’s best to put the wood as deep into the blades as possible during the cutting. This will give you the best cutting performance and keep your blades in shape for a long time. After using the anvil pruner to cut branches, wipe them clean, then apply some oil and store them in a safe place. Maintaining your anvil pruner will keep them in good shape for a long time. This will help you get the best performance out of them while avoiding problems. They are a simple tool so maintaining them is pretty simple as well. It’s important to keep the blade of the anvil pruner sharp before cutting. To do this you can use a sharpening stone or a hand file. Cleaning the anvil pruner is also simple. Depending on the model you have, you need to unscrew the nut and bolt that connects the two parts of the pruner together. Then you can clean the blades up with orange oil, vinegar, or WD-40 so that the sap, rust, and dust it off. Finally, apply some oil to the blades and put the nut and bolt back again. It’s also good to keep your anvil pruners clean and well-oiled before starting your cutting as well as once you are done with the cutting. Power Drive Ratchet Anvil Hand Pruning Shears - 5X More Cutting Power Than Conventional Garden Tree Clippers. EFFORTLESS CUTTING - The ratchet in the pruner is a clever extra mechanism to make light work of tough cuts. As you squeeze ratcheting pruning shears, they latch so you can release and squeeze again, performing the cut in easy steps rather than one go. As you cut through a branch, the ratcheting mechanism clicks and moves to the next setting, providing ever-increasing pressure as you cut. HIGH QUALITY HARDENED STEEL BLADES - Heat treated and hardened carbon steel blades are ultra strong, will last longer and are less likely to nick or need frequent sharpening. Coated with non-stick Teflon that resists sap and other sticky materials. 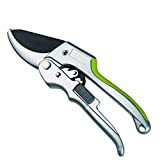 ERGONOMIC COMFORTABLE DESIGN - If you intend to prune frequently, you'll appreciate the way that a ratchet pruner will reduce wrist strain, require less pressure to cut, and generally make the pruning experience much more enjoyable. If you do a lot of pruning, this can make a huge difference in hand fatigue. Ideal if you are already starting out at a disadvantage with carpal tunnel or arthritis, or have smaller hands. 100% CUSTOMER SATISFACTION GUARANTEE - Order with confidence! The Gardenite 100% customer satisfaction guarantee means exactly that. We will fix any problems quickly and to your 100% satisfaction every time! We are always available to help our customers. Our customer service record is unmatched! The Gardenite Power Drive anvil pruner will help you prune dead branches that are up to 1½ inches thick. The best quality of this anvil pruner is it comes with a ratchet mechanism where you can cut in steps where the pruner applies increasing pressure. This gives you five times more cutting power than a regular anvil pruner. Such cutting power is very useful if you have carpal tunnel or arthritis and are looking for an easy cutting pruner. It is also useful for women who find it difficult to apply cutting power with regular pruners. The blade is made of hardened carbon steel which is high-quality and durable. It is coated with Teflon which means sap and dust won’t stick to it while cutting. This anvil pruner comes with a 100% customer satisfaction guarantee which means you can get a replacement or refund in case you are not satisfied with the product. The Gardenite Power Drive anvil pruner weighs just 8 ounces which makes it lightweight to carry around in the garden while cutting branches. The ratchet mechanism works great for cutting branches that are 1 inch thick but if you are trimming smaller branches it works a bit slow. Also, the locking mechanism seems to be a bit hard to use when engaging or disengaging it. 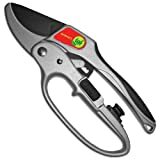 GREAT FOR SENIOR GARDENERS -- As we age, things become harder to do; these secateurs have an ergonomic design that makes handling and using them pain free, safe and simple. The Gardener’s Friend anvil pruner is useful to cut branches that are up to 1 inch thick. This pruner uses the ratchet mechanism as well which means you’ll be able to get cutting power five times more than a regular anvil pruner. This makes it highly useful for people who have a weak grip due to problems like arthritis or other problems. The Gardener’s Friend is an anvil pruner that has been developed with over 30 years of experience and so you are assured of good quality. The handles are ergonomic and comfortable to hold with a soft rubber grip that absorbs pressure. This makes it very useful for senior gardeners. The blades are made of high-quality hardened carbon steel that gives good cutting power and stays sharp for a long time. You can also get replacement blades in case they get dull and you need to replace them in the future. This anvil pruner comes with a 100% customer satisfaction guarantee. So if you’re not happy with the product you can return it and get a full refund. The Gardener’s Friend anvil pruner just weighs 7.8 ounces which makes it very lightweight to prune several branches without fatigue. The locking mechanism is a bit hard to use and you may find it difficult to open sometimes. The pruner is also a bit expensive when you consider the price of some others. The Fiskars Power-Lever anvil pruner can be used to trim dead plants and branches that are up to ⅝ inches thick. With the help of the power-lever technology, you’ll be able to cut branches with twice the power of a regular anvil pruner. The blade is precision-ground which means the cut will be sharp and will last you for a long time. The blade also has a low-friction coating which means you’ll be able to cut cleaner and there will be no sap sticking to the blade. It’s also nice that the coating is rust-resistant so you don’t have to worry about losing the tool to rust damage. The entire body of this anvil pruner is made out of steel which makes it highly durable. And the handles have a non-slip grip that will prevent the tool from falling out of your hands while cutting for long periods of time. Because of their steel construction, the Fiskars Power-Lever anvil pruner weighs 1.4 pounds which is a bit heavier than the other pruners that we’ve seen. The locking mechanism that comes with this pruner is not the best and you may find the latch hard to move. This anvil pruner is also quite inexpensive and ideal if you are looking for a high-quality one at a budget price. Like many Fiskars tools, this one comes with a lifetime warranty in case you find some defect in the tool. 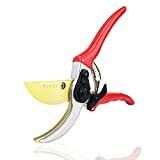 Pexio SK-5 Steel Blade Sharp Anvil Pruning Shears, Less Effort, Pulley Design. Quality Blades - Professionally built utilizing SK-5 Steel that meets the highest standards and gives you precision on each cut. Ideal use for cutting stems, light branches of trees, rose bush, shrubs and hedges. Solid Handle - Made of Hidh Quality chrome vanadium steel, and the special reinforced design makes the shears stronger and powerful. Effortless Design - The pulley design and spring loaded mechanism that easy cut branches in less efforts. As you squeeze pulley pruning shears, the pulley will scroll, providing ever-increasing pressure as you cut, thus decrease the force you need to apply on the handle. Ergonomic Design - The ergonomic design is friendly for both left and right hand use, while the anti-slip cushioned handle are strong,lightweight,and comfortable. Lifetime warranty, if there are any quality problem, please contact us, send your order number and take some photos of the product to us, we will provide a replacement to you ASAP. The Pexio anvil pruner comes with SK-5 steel blades that will help you cut dead branches that are up to ¾ inches thick. The blades make use of a pulley design and spring-loaded mechanism that will help you cut branches without applying a lot of pressure on the blades. The handles are made of high-quality chrome vanadium steel that makes the overall pruner high-quality and durable. The handles are also ergonomically designed to make them comfortable and lightweight to use. It is also convenient to use for both left and right-handed gardeners. The Pexio anvil pruner comes with a lifetime warranty so if you have any problems with it you can immediately get a replacement. This anvil pruner weighs just 8.8 ounces which makes it very lightweight for you to carry around in the garden as you go about cutting several plants and branches. The safety lock of this anvil pruner is difficult to use and you may have trouble with it. This anvil pruner is quite inexpensive but we find the Fiskars Power-Lever anvil pruner to be a better choice in budget anvil pruners. The Corona RP3230 anvil pruner is useful for cutting dead plants and branches that are up to ¾ inches thick. The ratcheting action will give you cutting power that is five times greater than a regular anvil pruner. This is very useful for senior gardeners as well as people with arthritis as you can cut thick branches without the need for applying a lot of pressure. The blades have a non-stick coating so that sap and sawdust do not collect on them while cutting and you don’t have to worry about cleaning them up frequently. The hand grips are specially molded so that the grip feels comfortable regardless of the size of your hand. The Corona RP3230 is an inexpensive pair of anvil pruners that should give you decent quality cutting power. It comes with a limited lifetime warranty that is useful in case you have problems with the pruner. The construction of this anvil pruner does not have the best quality but considering the price you should not be expecting a lot in that department. The locking mechanism can be a bit flimsy when you are locking and unlocking it. We know that a bypass pruner is a must-have tool as part of your gardening tool-set. However, there has always been a debate on whether you need to include an anvil pruner as well. But you can be sure that as part of your gardening experience you will need to cut dead plants, branches, and shrubs. Doing so with a bypass pruner can damage them by bending the blades or making them dull. Instead, you do need to use a good pair of anvil pruners to get the job done by cutting hard, dead wood. We recommend using the Gardenite Power Drive Anvil Pruner as it is the best on our list. You will be able to cut branches up to 1 ½ inches thick with it. It comes with high-quality hardened carbon steel blades that are sharp and will last you for a long time. The ratcheting mechanism used by these will help you cut with five times the power of a regular pruner. It is lightweight, durable, and comfortable to use and comes with a 100% customer satisfaction guarantee. If you’re looking for a very cheap pair of anvil pruners that still give good cutting power for the price then take a look at the Fiskars Power-Lever Anvil Pruner. You get an anvil pruner that can cut branches up to ⅝ inches thick. The power-lever technology will help you cut with a power twice that of a regular anvil pruner. The blade is precision-ground which makes it cut sharp and remain durable. And it has a low-friction, rust-resistant coating that will help keep sap, sawdust, and rust away from the blades. And this comes with the Fiskars quality and a lifetime warranty on the product.